This is the original version of the film based upon the book by J. B. Priestly. Not to be confused with the Columbia Pictures remake a decade or two later. When the rights expired 15 years after this was made, the film fell into obscurity and has only recently undergone a long overdue restoration. I must say it looks pretty good. Of course, the big selling points are screen legend Boris Karloff and Charles Laughton of Mutiny on the Bounty and Spartacus. However, the movie has a lot going for it in other areas. Director James Whale was no slouch, having turned-out the Universal Films classics Frankenstein, The Bride of Frankenstein, and The Invisible Man. Here he makes the best use of light and shadow since the silent movie Nosferatu in the 1920s. The Old Dark House has a mainly British cast, with great character actors. There is a definite class distinction in play here, designed to make the two later newcomers to the house clash initially with those already present. Unlike many modern day films, there are distinct and very separate personalities which makes the exchanges feel more natural. The Femm sister looks like an old Romany-type, and she’s hard of hearing, short, untrusting and bad-tempered. Her brother is quiet and refined (looking more like a butler himself), and is scared of his own shadow. Morgan the butler is a scarred and leering sinister presence, and when drunk is threatening and aggressive. It helps that he’s mute and murmurs a few unintelligible guttural sounds now and then. He’s certainly more of a menace than what is locked behind that door. Of the visitors, there is the well-to-do young married couple (the blonde woman of which Morgan leers at every opportunity he gets!). The man with them quickly falls for the dark-haired working-class showgirl, and they even promise marriage within a relatively short space of time. The wizened old woman in the bed is priceless. She at first seems quite sane and then shrieks and cackles like a lunatic. We really don’t see enough of her (although we continue to hear her periodically). This brings me to the dark humour which is ever-present, but cleverly only materialises through the character exchanges and idiosyncrasies. This is notoriously a difficult balance to get right in horror. 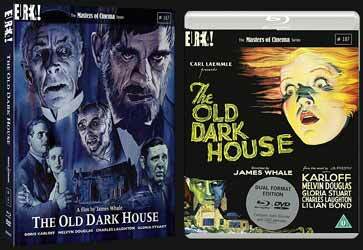 The Old Dark House succeeds by making you smile at the quirks or outright madness of the building’s occupants. It’s worth mentioning the model work at the beginning of the film, featuring the car struggling through floods of water, sliding on mud and just missing being trashed by a hill slide. It is very well done for the time. Extras include two commentaries, including one by critics Kim Newman and Stephen Jones; Curtis Harrington saves The Old Dark House (about tracking-down the film when it was thought to be lost); and Daughter of Frankenstein: A Conversation with Sara Karloff. This is the most entertaining feature. Sara talks about her father’s career, including the fact that he had made 80 films before the fame of Frankenstein arrived. He wasn’t even invited to the premiere. I didn’t receive a copy of the artwork by Graham Humphreys (shame on you), but I’ve seen the concept and it looks fantastic. This film has often been cited as the best horror film of all time. Certainly, it set the rules for what followed. In fact, The Rocky Horror Show wouldn’t have required too much rewriting from The Old Dark House’s screenplay. It’s mad, it’s zany, it’s funny, it’s creepy … The Addams Family. So you can see how this little 1930s film influenced many films and TV serials which followed. It’s great but far from being the best horror film of all time.